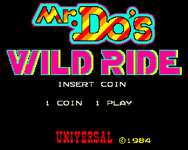 Source: Wikipedia, "Mr. Do's Wild Ride", available under the CC-BY-SA License. Mr. Do's Wild Ride is the third game in Universal's Mr. Do! arcade series. Mr. Do! 's Wild Ride, was released in 1984. Mr. Do! 's scenario is a roller coaster, and the object is to reach the top. As the cars (and eventually other objects) speed around the track, you must escape by using a super speed button, or by climbing up small ladders scattered about the track. Two icons at the end of the level range from cakes to EXTRA letters or diamonds change upon collecting cherries at the top of each letter. The game is timed, and the timer ticks faster when the super speed button is depressed.